​For nearly 30 years John Ziemnicki, principal architect and owner of World Design, Inc., has volunteered to help guarantee that Manatee County continues to have a highly-skilled workforce through his unselfish dedication to Manatee Technical College. During these years Mr. Ziemnicki has served on and as Chairman of the MTC Drafting Advisory Board. Mr. Ziemnicki has entered his ninth year as Chair of the MTC Board of Governors of which he has been a member for 13 years. He is also in his seventh year as chair of the Manatee Technical College Foundation which he helped to create in 2002. MTCF, a separate 501(c)(3) organization, has as its sole purpose to acquire resources in order to help MTC achieve its mission. Most notably, the Foundation grants scholarships to MTC students for tuition, books, uniforms, lab fees and classroom supplies. Earning a bachelor’s degree from the School of Architecture at the University of Wisconsin-Milwaukee, Mr. Ziemnicki holds a National Council of Architecture Review Board certificate. He is a 28-year member of the American Institute of Architects and a seven-year member of the Manatee Architects Association. A veteran of the United States Air Force, Mr. Ziemnicki served during the Cold War and in Vietnam. The Manatee Technical College Alumni Association is proud to name Mr. John Ziemnicki as its Outstanding Volunteer of the Year. Bradenton, FL: The Beverly Beall & R. Kemp Reichman Foundation has partnered with the Manatee Technical College Foundation to create a donor-directed fund to benefit Manatee Technical College students enrolled in the building trades, business training and medical professions programs. Their initial donation of $10,000 will help sustain the on-going work of MTC Foundation which regularly provides financial assistance for tuition, books, uniforms and other expenses for deserving students as well as defraying expenses for Manatee Technical College programs. Beverly Beall & R. Kemp Reichman Foundation joins others who have chosen to invest in the future of Manatee County through the establishment of their own donor-directed funds. MTC Foundation is also proud to partner with the Longboat Key Firefighters, Weldon Frost & Mobil/Exxon, Rex & Ruth, Pepsico/Tropicana, Air Products, the Baden Foundation, Crosthwaite Fishing Tournament and Manatee Technical College Alumni Association. Through the generosity of the these organizations and individuals, MTC Foundation has been able to award more than $100,000 in financial assistance to MTC students and some $30,000 for MTC program support. ’A COPY OF THE OFFICIAL REGISTRATION AND FINANCIAL INFORMATION MAY BE OBTAINED FROM THE DIVISION OF CONSUMER SERVICES BY CALLING TOLL-FREE WITHIN THE STATE. REGISTRATION DOES NOT IMPLY ENDORSEMENT, APPROVAL, OR RECOMMENDATION BY THE STATE. “If you have any questions or require assistance, please contact us at 800-435-7352 or via email at cscompliance@freshfromflorida.com. ​Three recent recipients of MTC Scholarships express their gratitude for the opportunity to ensure their future success to benefit themselves, their families and the community. “ Receiving this scholarship was a big deal for me. It gave me the opportunity to go after my goal of becoming a hair stylist. I’m extremely happy. 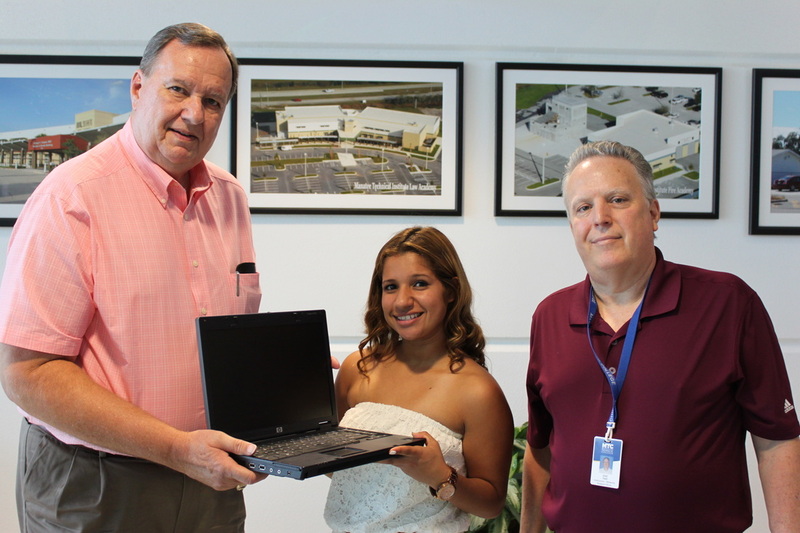 Foundation Chair John Ziemnicki (left) presents a laptop computer to high school student Jessica Gonzalez as MTC Networking Services Program Instructor Joel Hall (right) looks on. This presentation was made possible through the Computer Redistribution Program within the Manatee County School District and is administered by the MTC Foundation. Thus far, nearly 100 students have received computers through this program. Used computers from the School District are donated to the Foundation, refurbished by MTC Networking Service Program students as part of their training, and then redistributed to underserved students within the District. To date some 50 students have benefited from this program. Manatee Technical College Foundation (ID # 30-0096001) is a 501.c.3 not- for- profit public charity. ‘’A COPY OF THE OFFICIAL REGISTRATION AND FINANCIAL INFORMATION MAY BE OBTAINED FROM THE DIVISION OF CONSUMER SERVICES BY CALLING TOLL-FREE WITHIN THE STATE. REGISTRATION DOES NOT IMPLY ENDORSEMENT, APPROVAL, OR RECOMMENDATION BY THE STATE. “If you have any questions or require assistance, please contact us at 800-435-7352 or via email at cscompliance@freshfromflorida.com.